I F*cked Up is a PocketFives series where the game’s best tell stories of where they got it wrong. Mistakes happen every day in poker and let these players be the first to tell you it happens to everyone. Before making the 2014 World Series of Poker Main Event final table, Bruno Politano was a respected tournament player in his home country of Brazil. Politano had a fair amount of tournament success there prior to bringing his game to the United States. 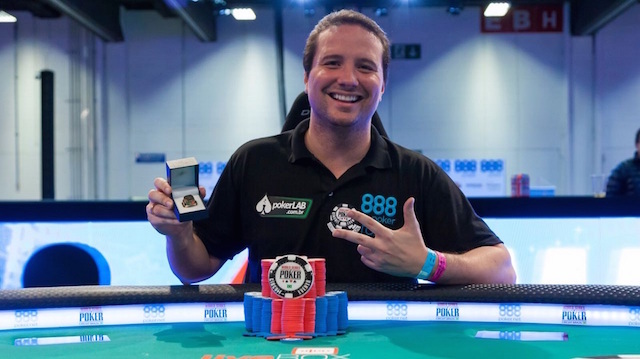 In 2013, Politano was among the final three at the Brazilian Series of Poker Main Event out of 572 entrants. Politano and an opponent held dominating stacks over the other play. Politano was attempting to win his second BSOP title after doing so in 2008. Things were looking good for Politano to make it to heads up but a costly bluff sent him out in third place. Politano opened the button with and his similarly-stacked opponent called out of the big blind. The flop was J-7-3 with one club, giving Politano a straight draw and backdoor clubs for a flush. The big blind checked and Politano bet 75 percent of the pot. His opponent called and the turn gave Politano the flush draw. After being checked to, Politano bet 85 percent of the pot. Politano says he did this in order to set up an all-in shove on the river. The hit and Politano did just that, moving all-in for 35 big blinds. Politano’s opponent had roughly the same stack and tanked for three minutes for the biggest pot of the tournament. After the thought process was completed, Politano’s bet was called by pocket tens to pick off his bluff. Politano was eliminated in third place and had his chance at winning the title gone along with it. Politano was devastated after the hand and realized his mistake in being too aggressive with a spot effectively assured for heads up play. He would end up taking home $47,493 for his finish, a far cry from the $108,917 awarded for first place. In an attempt to put pressure on his opponent who had a nearly identical stack, the plan blew up in Politano’s face. “I tried to pressure because the other opponent had only 25 blinds. I learned pressure is important but there needs to be equilibrium. Pressure is good, but when it’s not intelligent, there’s a great chance to put it in the trash,” Politano said. Politano says he didn’t run into any spots quite like that one in the WSOP Main Event but notes the overall experience taught him well for that run and future final tables. Politano recommends playing with your opponent’s mindset considered and making decisions that way, instead of on pure emotion. Should Politano make another final table in the near future, rest assured he will not be making the same mistake twice.